Gen Next - Are we heading in the right direction? Modern man is just ancient man... with way better electronics. Having led a mostly impassive life, today was one of those occasions when I felt the need to react to whatever is happening around me. What is rare about today is that I have chosen to overcome my inherent laziness and write about it. As it often happens, the incident itself was minor, but it has caused me to vent out a few things that have been nagging me in the recent past. Now, if you have not set up a decent base in the wonderful social networking site twitter, you might not even be aware of the incident in question. So, let me just update you in brief. 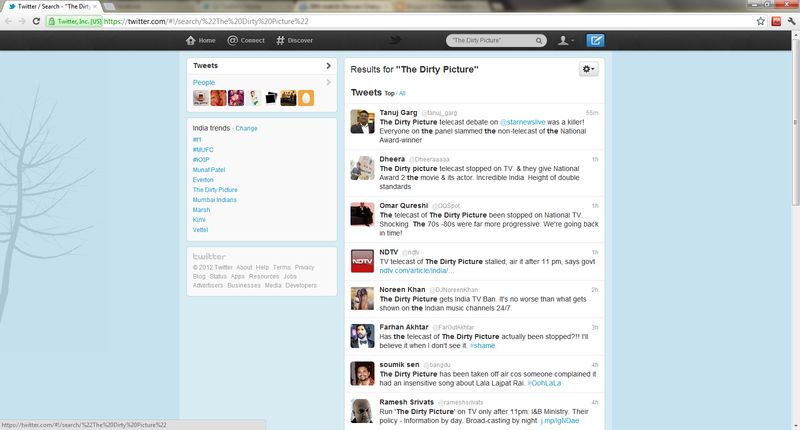 The Dirty Picture was scheduled to be screened in Setmax this afternoon. It seems the channel had acquired a clearance from the Bombay High Court, and was all set to screen the movie as per schedule (with quite a lot of cuts). Just before the scheduled time, the Ministry of Information and Broadcast, having suddenly decided that the movie is not proper for matinee viewing, directed the channel not to screen the movie during daytime, and to screen it after 11 PM instead. Now, this was just a passing news for page 3. I was not even aware of this snippet of information until I logged into twitter. What greeted me was an combined outrage by all the twitterati and twitteople. Having nothing better to do, I decided to click on the trending topics, and see what the fuss is all about. I saw that almost everyone seemed to be outraged at the fact that the Government was trying to decide what is suitable for us. Let me declare at the outset that I have nothing against the movie. In fact, I haven't watched it yet. Till an extent, I am against censorship too. An artist has the right to express what he considers as his opinion, and the citizens of the country have the right to choose if they need to experience the piece of art themselves. In fact, I am not concerned at all if the Ministry I & B was right in restricting the channel (I believe that their intention was correct. Television programs need censorship to an extent simply because they are easily accessible to children). But there are other things about this outrage that concerns me, and I have listed them below. 1) Time and again, various tweeters have expressed that twitter is a breath of fresh air from the mainstream media. They accuse the mainstream media of being sensationalist, while they consider twitter is more reliable in highlighting important events. I agree to this to a large extent, because I am pretty sure that my hang on current events has improved considerably since the time I started using twitter seriously. On the other hand, considering that twitter gives lesser importance to a collector being abducted than a movie not being screened on TV, how can we accuse the mainstream media of being sensationalist? It is pretty clear that the media is just giving us what we want, and that the public should change their priorities first, before they can expect the media to. 2) The new generation of the people of India are quite 'modern' in their outlook. They have broken almost all the taboos of our forefathers, and will soon break all of them. From a predominantly theist country where Sadhus and Sanyasis prospered, we seem to be transforming into a country of agnostics and atheists, where rock stars are prospering. Despite the accusations thrown on the internet, this generation reads a lot, watches movies made in every corner of the globe, mocks at superstition, fights for freedom of speech, takes feminism seriously, and often does this all with a refreshing sense of humor. Most of these changes are heart-warming. But I feel that it might not be wise to discredit all the ideas our forefathers had. I can see a lot of people around me who project themselves as having a liberal mindset when they actually do not. It is as if being liberal is a fad, and people prefer being 'cool' over being themselves. If it is really true that people are blindly accepting the ideas of liberalism simply because it is popular, it is a fearful thought. It is always dangerous to have only a single popular stream of belief throughout the globe, since these people were as much the victims of popular belief as they were of the church. 3) The immediate reaction to this ban was to blame the Government. Looking at the trends of the past year, the modern day public is holding the Government, and sometimes the system itself, responsible for everything wrong with the country. Instead of improving the system, or using it properly for betterment, we seem intent at completely rewriting the system. As the response to recent Anna Hazare protests (I have more to say on what I think about Anna in a partially completed post) showed, we are in danger of discrediting our democracy. The protests might be held with really noble intentions, but we must be careful that we do not slip into the anarchy. 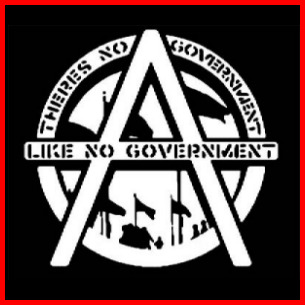 After all, the current global setting is perfect for anarchy to prevail. As soon as I was born, my mother came close to my ears, and whispered "son, one day you could become anything. You could become anything you want". Thus the adage that you are in control of your own destiny was inflicted in me soon after my birth. I had no reason to doubt it, until I heard that voice on a fateful day soon after my 60th birthday. As soon as I heard the voice, the realization that my destiny was as much controlled by the other Man as by me, if not more, struck me like a lightning. I also realized that my mother had only been half-correct. The voice,belonging to a Man, had simply said "Ah! That one would make an excellent bureau!". With those words uttered by the voice, my life - a large part of which had been spent standing peacefully in a jungle among creatures behaving with a consistency that I now miss - changed its course. 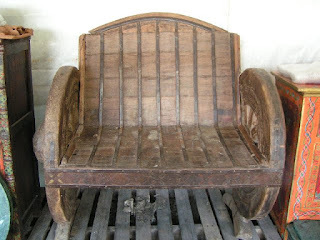 Though I didn't end up as a bureau, I ended up as an "old teak chair"
As you must have noticed by now, I am not an eloquent narrator. I would blame it on the lack of practice. It is not that I don't have much to say. Think about it, after all, like my brethren all around you, I have a keen eye for detail. It might be shocking for you to realize it, but my brethren and I have been watching you, and we have been noticing a lot of things you do when you believe that you are alone. No, it is not that I don't have much to say, it is just that, until now, I have never felt the need to say. But in the past few days, I have seen some really strange little things, strange even by my standards. Ever since I saw them, I have felt the irresistible need to talk about it. It is as all four of my legs would burst, unless I recount the short, but strange tale. Without further delay, let me describe the incident. My current master brought me for a worthy price at an auction a few years ago. Ever since, I have been the darling of his eyes or, rather his posterior. After a tiring day's work, nothing would relax him more that a peaceful sedentary session with me. Having lived at his house for quite sometime now, I had just begin to feel settled. I was hence surprised when my master packed me in a cardboard box few days ago. Blinded and suffocated, I could sense that I was being moved somewhere. As with all other journeys that I have been through, I had a tedious time throughout. I couldn't wait to come out of what seemed like a coffin, and get a whiff of fresh air. After what seemed to be a really long time(standards change when you are locked up in a box and are barely able to breath. I have seen Men change their standards for far less), we came to the end of our journey. I wasn't unpacked yet, and after a few minutes, I was carried by hand somewhere. Judging by the change in pressure, I was being taken upwards (having spent most of my life in dormant positions, I am highly sensitive to changes in altitude). When I was finally able to open my eyes, I was in a room. The room smelt as if it had been cleaned only recently. From where I was placed, I couldn't see the entrance of the room, and worse, I couldn't watch the television. All I could see was a bed, placed in a perpendicular direction to me. By stretching my eyes a little to the left, I could see an open window. Rays of morning sunlight entered through the window, and illuminated the bed in front of me. I wondered if my master had shifted here for good. I was a bit upset at this thought, but the fact that I will still be owned by a person I had got used to cheered me up. From the other rooms, I could hear my master shifting more furniture. After about an hour, the sounds of furniture stopped. I could now hear footsteps, and they were moving away from me. I told myself that this was just a normal day, and like every other day, and the master would come back in the evening. Maybe he will pull me in front of the television, and fall asleep on me. Throughout the night, I could watch one of the most amazing inventions of Man. By now, I could hear the door shut, and his footsteps climb down a staircase. I had been right about the house being above the ground level. I desperately hoped that I was right about my master coming back to me too, but my intuition told me that he won't. The length of the sunlight in the room slowly receded as the Sun climbed up. I kept staring at the empty bed, and the wall behind it. Soon, it was dusk, and I still had nothing interesting to observe. For the first time in my long life, I regretted not being able to turn my neck around. I had no way I could see even the entrance door of the room. A couple of times through the day, I thought I heard a flutter outside the door, but realized that it was wishful thinking. Gradually, my mind was getting depressed contemplating the uninteresting future ahead of me, and this depression must have led me to sleep. I have no idea for how long I dozed. But when I did open my eyes, I saw the two of them. My initial reaction when I saw them was to be surprised at not having heard them walk in. With all due modesty, I have a very keen sense of hearing. In fact, my sense of hearing is so keen that by just hearing a person's footsteps once, I can easily identify him just by hearing him walk. I was surprised because I hadn't heard them walk across to the bed, and by the look of it, they had been in the same position for long. One of them was a middle-aged man, and the other was a young boy. The windows were drawn, and they were illuminated by a single candle placed before them. The boy was resting his head on the older man's lap. I was stripped of my initial surprise at not having heard their footsteps, attributing it to my disappointed state-of-mind, and was now filled instead with curiosity. They were already into a conversation. "I felt it today uncle. I am sure something is about to happen". The boy said, in a voice that betrayed fear. When the older man replied, his voice seemed to come from a distance, as if it didn't belong to the him. "Nothing will happen my boy. They won't dare to come here." "I am afraid of them. I really hope they don't come here." "You have nothing to be afraid of. I have been living here for quite sometime now, and I have never felt their presence here. Now, you have had a tiring day, and it's time to go to bed. Did you drink the milk I kept for in the kitchen?" "Quick then, drink the milk, and sleep", the uncle said, his voice now raised to a gentle command. The boy got up, and walked with an unconvinced look. My mind registered his footsteps as unnaturally light. The uncle blew the candle, and the room was cast into complete darkness. I could hear some notice from the kitchen, wherever it was, but the noise stopped soon. As the minutes passed, the house seemed to be eerily silent. I kept vigil for a few more minutes, staring at the blankness and seeing nothing, and finally I dozed off. When I woke up again, the uncle was not in the room. Once again, my senses had failed to awake me at the sound of his foot-steps. I could hear very light footsteps walking around from the other rooms, and I identified the footsteps as that of the boy. Not much happened for a long time, and occasionally I could hear the boy roaming around the house. Around noon, after a reasonable period of silence, I could again hear the boy's footsteps. I didn't give much attention to it, and continued to concentrate on what I had been doing, which was nothing. But then, I heard two people climbing up the stairs. Both pairs of footsteps were new to me, and I wondered if one of them belonged to the uncle. In a couple of minutes, the boy must have heard them too, because his footsteps stopped abruptly. Now, I could even hear voices. Abruptly, I could hear the running footsteps of the boy, and I realized that he was coming towards my room. He soon entered the room, and I could see that he was frightened of the footsteps from outside. He closed the door of the room without locking it, ran and attempted to hide behind the head of the bed. His eyes were facing the door, and I could see his face, which was white with fear. I had no doubt that anyone else walking into the room can see him too. Meanwhile, the noise from outside the house increased. The footsteps had momentarily stopped, and I heard a key being inserted into a lock. The door opened, and one loud and masculine set of footsteps entered the house. Apparently, the other person stayed outside the door. The Man who had entered the house seemed to be unaware of the tension in the room I was in, and he seemed to be casually wandering around the house. With each passing moment the boy in front of me turned whiter. The footsteps from outside came closer towards my room now, and there was a creak as the door opened. A couple of steps more, and I could see an unremarkable man walking inside the room, whilst looking at me with mild interest. He was now exactly front of me, and was turning his head toward the bed. I turned my full attention to the boy. He was shaking with fear, but rooted to his spot, as if the visitor might attack him anytime. And then I heard the ear-piercing shriek. It took me a moment to realize that it was coming from the visitor. The man seemed to be as much afraid of the boy, as the boy was of him. He was still shouting, as he took a couple of steps back, turned around and ran out, knocking a few things on his way out. The boy still stood at the same spot. I could soon hear blurred voices from outside. The visitors were running down the stairs. I heard the women shout something like "I told you so! The neighbor warned us before coming here. This must be the reason he offered the house at such a low price!" As the noises faded, the house was cast back into silence. The boy just stood there for sometime, and soon walked out of the room. Soon, he climbed down the stairs, and I was left to myself once again. I had plenty of time to ponder over what had happened, but still couldn't make head or tail out of it. A few more hours passed before I heard the boy's footsteps again. It seemed the boy was speaking to himself as he climbed the steps. As the door to the house opened, I could make out what he said. "No, you go in first." He still sounded agitated. I was startled when I heard another voice replying to him. "All right, you stay outside for a minute. See, no one is inside. And I am sure no one will be coming back for sometime". It was the uncle. "You are so sure of everything." The boy entered the house, and his voice lost some of its initial fear. "But, why didn't you believe me when I said they were coming. You almost convinced me that they won't". The uncle sighed, took a deep breath. "Look", the uncle started speaking in a explanatory tone, "you are very young, and you are very new here. Whereas, I have been here for quite some time". The faint footsteps of the boy becoming a little stronger as he spoke. Both of them were walking towards my room. "As time goes on", he continued, "you will start losing all your senses. It starts with your sense of touch, and when you are as old as me,it becomes very difficult to sense these humans. Soon, you will start moving like me too". "Humans! ", he uttered the word as I would have uttered them, if only I could speak - with rage, combined with a feeling of powerlessness. "These humans are everywhere. They take over all houses, destroy them, and rebuild them. At this rate, we soon won't have any more houses to haunt." As he said this, the uncle entered the room. As soon as I saw him, I understood why I had never been able to hear his footsteps. He didn't walk, but glided in. It was almost as if he didn't have a pair of feet.